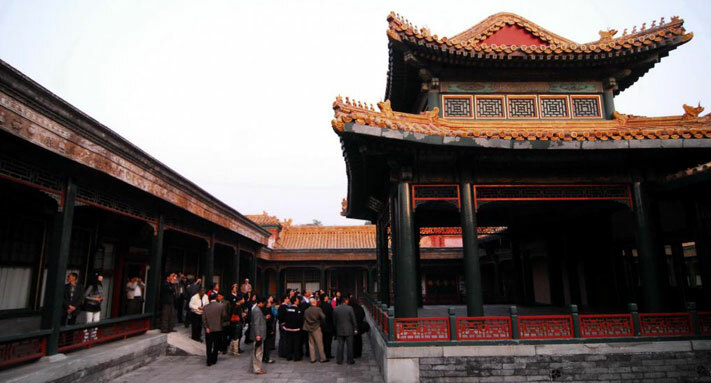 There may be a mystery reveal for visitors in the Palace Museum, the Hall of Consolation of Mother, Palace of Longevity and Health and other palaces like hall for worshiping Buddha in west roads. In this area paranormal activity has been known to occur (referring to ghost reports, monster sightings, psychic experiences and other mysteries of the unexplained). The youngest Palace of Treasure Storing tells the story of the removal of treasures.’ Meridian Gate makes visitors feel like like they’re apart of the celebration of Emperors’ and Empress’ birthday. Even the menu from Emperor Qianlong’s mother’s birthday is available for visitors to see. At the East Gate of the Imperial Palace visitors are given an introduction of the historical artifacts there and how the palace was constructed. Shan Qixiang, the curator of the Palace Museum, then talks about the experience of paranormal activity here and makes sure that visitors know that workers of the museum have not experienced any of this. The opening of more palaces to visitors aims at displaying an authentic and unique experience at the Palace Museum. During the last few centuries, the garden of Hall of Consolation of Mother has stood gracefully. Tomorrow, it will be open to visitors for the first time. Currently, there are nine buildings in the southern and northern parts amid stacks of rockworks and pounds. Xianruo Hall is located in the center of the northern part and is next to Ciyin in the north, Baoxiang in the east and Jiyun in the west. It is the first one to be accessible to visitors out of over 40 Buddha worshipping halls in the Palace Museum. Above the main hall there is a tablet with the phrase, “Shouguoxiangtai” (Baldachin of country of longevity) and a pair of couplets on the beams that were written by Emperor Qianlong. In the hall center, a worshipping table is placed, and two small stupas are separated in the either room of the palace. These seven-story stupas have an octagon shape and five hundred ceramic figures of Buddha that were made under Emperor Qianlong are placed there. Additionally, three Buddhist banners are hung. “The setting of Xianruo Hall has not been changed until the building was renovated in 1984. According to videos and photos of the Imperial Palace, all the objects are arranged as they were before,” experts stated. The Garden of Hall of Consolation of Mother was built in the fifth year of Emperor Jiajing’s rule in the Ming Dynasty and to satisfy Empress Dowager Chongqing’s need of worshiping Buddha. Laterr, in the 30th year of the regime of Emperor Qianlong the great rebuilding project was conducted at this garden. The southern part of Linxi Pavilion is constructed in a stone bridge in a rectangular pound and faces the water both in the east and west. Visitors can walk through this pavilion. According to the statistics of the Palace Museum, there are 106 types of trees in the garden. Shan Jixiang said that the flower terrace is set on either side of the Linxi Pavilion where peonies are planted. In the spring the blossoms cluster and bring aroma to the garden. Tips: Furnishings of the artifacts are too close to one another in Xianruo Hall, thus, audiences are only allowed to enter through the porch. Do you know that there are terracotta warriors in the Palace Museum? The Hall of Consolation of Mother will be a long-standing sculpture center tomorrow for the exhibition of about 400 stones that date back to the Qin Dynasty. “Some of them are allocated and transferred to be collected here after the found of People’s Republic of China,” said the curator Shan Jixiang. Moreover, visitors can see the most sculptures in a closed way without thick walls. For the sake of historical artifacts, all of them are painted with a type of protection material which is ventilated so there is no moisture. Why are all the artifacts not exhibited as they were? Well, on March of 1973, to welcome of Norodom Sihanouk of Cambodia in Luoyang, some precious historical artifacts were borrowed and not returned until now. The most precious is the Buddha sculpture once stored in Baima(White Horse) Temple. As the largest ancient wood-structured buildings all over the world, the Palace Museum is home to about 6,000 architectural historical artifacts which aren’t publicized to visitors. The curator, Shan Jixiang, has suggested that the Palace Museum have a special exhibition for art of architectures, but it hasn’t occurred. Tomorrow, however, this will turn into reality; the renovated East Gate of the Imperial Palace will be available to visitors as an exhibition center for ancient architecture. This place is divided into two parts by glass stairs. In the upper floor arch---one of core structure(a system of brackets inserted between the top of a column and a crossbeam) of ancient architectures is hung in the middle so the audience can have a view of it; design papers and stereomodels of imperial gardens like the Imperial Palace, and others are exhibited. Visitors can also see the Palace of Prolonging Happiness and Palace of Eternal Spring. Even lost palaces like Qingxiatang of the Old Summer Palace(Yuanmingyuan) reappears in the district. All the stereomodels are perfectly designed; however, there aren’t many paintings in the rooms. What does the colored drawings of Shufangzhai look like? What are the differences between the paintings at flying rafters of Palace Museum? You can find the answers to these questions here. You can even look at ornaments of beasts on the eaves of Hall of Supreme Harmony. Architectural specialists call this the “end of one’s rope,” because these structures are used for underpinning tiles. Tips: Over 400 architectural stone carvings will be put on display in the exhibition area of Imperial Equipage Department Strict under the East Gate of the Imperial Palace where visitors can take a look from upstairs or walk in the exhibition area. With graceful and exquisite eaves, one of landmark buildings of the Imperial Palace is available to visit. You can step in there tomorrow for the first time. The city wall from the East Gate to Meridian Gate will be accessible to visitors where they can examine the architecture of the Imperial Palace while strolling on the city wall. Today, wooden trestles have been erected along the side of the city wall and sightseeing stands have been set for tourists to take photos. Tips: The city wall in the southeastern part can at most accommodate 200 visitors each time, so 50 people are permitted to enter the place every 5 minutes. Where Treasures of the Palace Museum be collected? The Treasure Restoring Palace has many Chinese cultural characteristics that were once used as warehouse for historical artifacts. Through renovations the second floor is an exhibition hall where the first exhibition “The Early History (1925-1949) of the Palace Museum” was held. Over 20 years the Palace Museum witnessed the difficulty of establishment and development and removals of treasures. Boxes for carrying them and photos of vestiges of gardens of Palace of Established Happiness are exhibited. The Treasure Restoring Palace is considered an important part of history. Wooden floors squeak while people step in the building. Several Column-shaped western exhibition closets are set there with old-fashioned keys in their holes and small wooden tablets displaying characters written by Chinese writing brushes. Tips: This building is half-timbered so a limited amount of people can be there at one time. Monitoring and observing will go on after opening visitors who have to pre-book tickets. Shan Jixiang, the curator of the Palace Museum, predicts that a small amount of people will be interested in visiting this palace; therefore, the provisional number of visitors is estimated at 50.